Lieutenant General Jeff Buchanan assumed command of United States Army North (Fifth Army) on 26 August 2016. He was commissioned as a Lieutenant in the Infantry in May 1982 after graduating from the University of Arizona with a Bachelor of Science in Wildlife Ecology. He also holds a Master of Arts in Leadership Development from the United States Military Academy. Lieutenant General Buchanan's military education includes the Infantry Officer Basic and Advanced Courses at Fort Benning, GA; the United States Army Command and General Staff College at Fort Leavenworth, KS; and a Senior Service College Fellowship in Geneva, Switzerland. Lieutenant General Buchanan's duty assignments include command and staff positions within the 82nd Airborne Division, 25th Infantry Division, 101st Airborne Division, and 10th Mountain Division. He also served as a Company and Battalion Tactical Officer at the U.S. Military Academy, the Director for Operations (J3) of Joint Task Force Full Accounting, and the Senior Light Infantry Task Force Trainer at the National Training Center. Lieutenant General Buchanan served four tours in Iraq and one tour in Afghanistan. In 2003-2004 he was the Director of Operations (C3), Coalition Military Assistance Training Team. Between 2004 and 2006, he commanded the 2nd Brigade, 75th Division (TSB) and deployed a second time to Iraq to serve as an advisor to the Iraqi Special Police Commando Division. Upon his return, he served as the Director of Operations for U.S. Army North (Fifth Army) at Fort Sam Houston, TX until November of 2007. From 2007 through 2009, he served as Deputy Commanding General for the 10th Mountain Division including a deployment to Iraq as the Multi-National Division-South. Following an assignment as the G-3/5/7 for the United States Army Reserve Command, he returned to Iraq for his fourth tour there as the Director of Strategic Effects (J9), U.S. Forces Iraq, from July 2010 to December 2011. 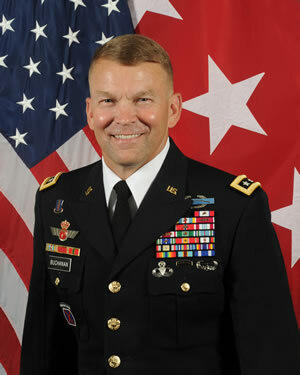 Lieutenant General Buchanan served as the Deputy Commanding General, I Corps from 2012-2013, and then commanded the US Army Military District of Washington/Joint Force Headquarters-National Capitol Region from 2013-2015. He most recently served as the Resolute Support DCOSOperations/Deputy Commander (Operations) for US Forces-Afghanistan in 2015-2016. Players click HERE to see details and register.